Juicy, plump red strawberries are the delicious reward for enduring a long, cold winter. Buy them in the spring when their prices are lowest in the summer, when the local season peaks — at least in Canada — and freeze what you don’t eat now for smoothies later. While wild strawberries have been around since ancient Roman times, the strawberry we know today was first cultivated in Brittany, France in the late 18th century. 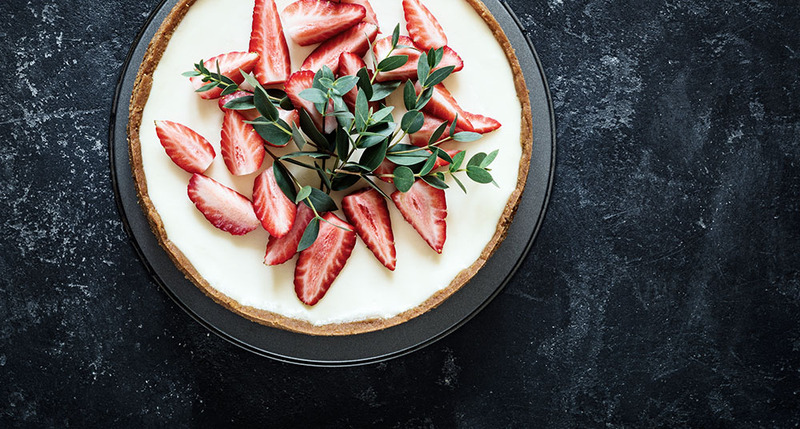 Nutritionally, strawberries provide antioxidants, fibre, folate, potassium, magnesium and vitamin C. They’re also low in calories unless, of course, you enjoy them in this decadent strawberry cheesecake, a lovely dessert to offer guests at a spring gathering. In a medium bowl, mix together pecans, crumbs and butter. Press into the bottom of a 10-inch springform pan. Set aside. Make filling: In a large mixing bowl, beat cream cheese at high speed until smooth. Add eggs, sugar, lemon juice and vanilla. Mix thoroughly. Spoon over crust. Bake at 350°F for 50 minutes. Remove from oven and let stand 15 minutes. In a medium mixing bowl, beat sour cream, sugar and vanilla until smooth. Spread over cake and return to 350˚F oven for 5 minutes. Cool to room temperature and refrigerate. Before serving, make glaze: In a small bowl, mix water and corn starch together until smooth. In a medium saucepan, add water/corn starch mixture. Add jelly and cook over medium-high heat, stirring constantly, until jelly melts and mixture thickens. Cool to room temperature. Remove cake from springform pan. Arrange strawberries on top of cheesecake. Spoon glaze over berries. Alternatively, to make cutting the cheesecake easier, you can mix the strawberries and glaze together and serve in a separate sauce bowl.